Follow the steps below to add option selections to the Order Printer app. 1. Starting from the Order Printer app, click the Manage templates button in the upper-right corner. 2. Click on the Invoice template. 3. Copy the following code snippet. 4. 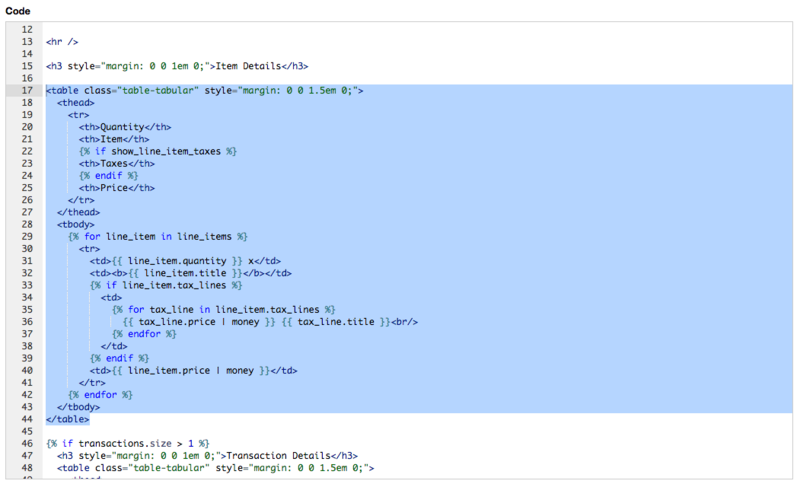 Locate the Code editor, then replace the snippet seen below with the copied snippet. By default, the code starts on line 17 and ends on line 44. If you aren't seeing the correct code on these lines, locate it by identifying the first open table element (<table>) and it's closing table element (</table>).